Martha and the Muffins's 1984 album 'Mystery walk' featured a sticker crediting the band as 'M + M o/k/a (once known as) Martha and The Muffins'. The album was produced with Daniel Lanois. The album gave the band - whatever they were called then - their biggest hit in years in their native Canada. 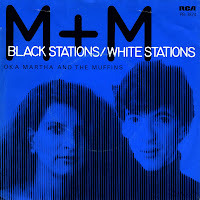 'Black Stations/White Stations' was an anti-racist anthem whose first verse took radio stations to task for refusing to play a song about mixed-race romance, a story that Martha Johnson had heard related on the radio while driving in her car. I remember I was really intrigued by this song in 1984, especially because of the interesting video. When I bought the single years later, the song was not as special as I'd remembered. This single is one of the big mysteries of my life. I bought it in 1980, not long after it came out. Then, some months later, it simply disappeared. I know I had it, but it was gone. To this day I suspect my brother, who nicked singles whenever and wherever he could when we lived at our parents's house. The single never reappeared. I bought this copy in 1994. In a way, I was satisfied: it was an English pressing after all. But the mystery was never resolved. 'Echo beach' is one of the best tracks of that year, 1980. Recorded by the Canadian band Martha and the Muffins, it was elected the 35th greatest Canadian song of all time in 2005 by CBC Radio One. 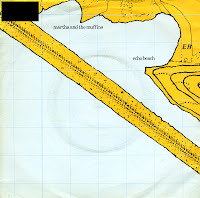 Although Mark Gane was not aware of a real Echo Beach when he wrote the song in 1978, several people wrote to him asking if it was about a beach in their local area. However, Echo Beach, as mentioned in the song, does not refer to a real beach but is rather a symbolic notion of somewhere the narrator would rather be, somewhere 'far away in time'. The song was covered later by Dimestars, the band of Kim Wilde's sister Roxanne, and by Toyah.